Therapeutic Cajeput acts at the source of the problem with potent antiseptic properties to prevent further pimple eruptions. To use: Use as a spot treatment by massaging onto pimple. Or supercharge your daily moisturizer by mixing in a couple drops of Bl+C and use as a preventative treatment. Not intended to be used with Retin A or for people with sensitive skin. Ingredients: Highest-grade cold-pressed certified virgin organic Black Cumin (Nigella sativa) oil, Certified organic Cajeput (Melaleuca minor) essential oil, Certified GMO-free Vitamin E (Tocopherols) oil. This is my go to spot treatment serum! Works for my skin and it does reduce the size of the pimple overnight and sometimes even totally got rid of it! Love it! Using it as a spot treatment at night and within my regular moisturizer during the day. Smells great, absorbs well, and I like the consistency. Alas, I haven't found it helping too much for my combination skin / breakouts. 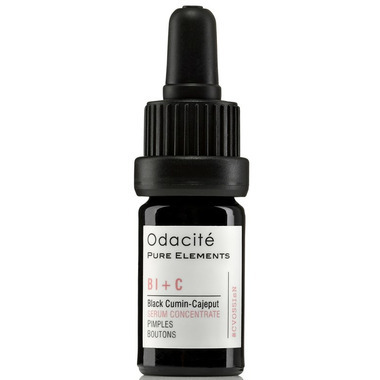 This is my favourite of the odacite serums, and I am already on bottle #2. I use it according to the instructions - 2-3 drops added to my serum or moisturizer and I have found the bottle lasts a while that way. I also use it for occasional spot treatment. It has kept breakouts at bay and I have been impressed. This oil work on pimples very well, big one small one all would be calm down and be gone in a couple of days! Amazing! Highly recommended!